Written by Fois Francesca and Montenegro Machado and published in The Conversation, 30/08/2018. For more than half a century, the indigenous Kaiowá and Guarani people of Brazil have been deprived of their ancestral lands, and consigned to small reserves where it is impossible to maintain their traditional livelihoods. Generations of these indigenous peoples’ lives have been marked by violence and vulnerability as they have tried to reclaim what, according to the Brazilian constitution, is rightfully theirs. And now we have found that increasing globalisation is posing an urgent threat. 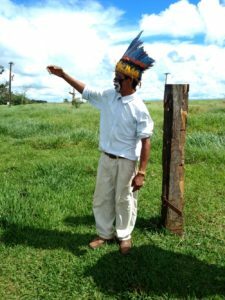 In March 2018, as part of the Global-Rural research project based at Aberystwyth University, we visited the Kaiowá and Guarani people who live near Dourados, in the southwestern state of Mato Grosso do Sul. We investigated how increasing worldwide intergration is impacting the Brazilian countryside, and explored the ways in which the Kaiowá and Guarani peoples’ lives are being affected by the intensification and expansion of industrialised agriculture production used for foreign markets. We spoke to indigenous leaders and families based in several Kaiowá and Guarani villages across the municipalities of Juti, Rio Brilhante, Dourados and Caarapó, and found out the devastating consequences of globalisation on their way of life. The first dispossession of Kaiowá and Guarani indigenous lands took place at the end of the 19th century, when the Brazilian government gave five million hectares to the Mate Laranjeira Company. Under the pretext of defending the interests of the native peoples, the state also founded the SPI (Indian Protection Service), which created indigenous land reserves. Different ethnicities (the Kaiowá, Guarani, Terena and others) were forced to live together in these reserves, despite historical hostilities. They were catechised, taught to communicate in Portuguese (and strongly discouraged from using their native languages) and became assimilated as “Brazilians”. There was not enough space in the reserves for the people to continue hunting, and use the local natural resources for their subsistence as they had done traditionally, so they were forced to learn the professions of the non-indigenous. In the 1980s, after the military dictatorship, when Brazil was engaging in a re-democratisation process, the Kaiowá and Guarani found themselves at a crossroads. They would cease to exist if they continued to live on the reserves, or they could leave and reoccupy their ancestral lands to preserve their culture, roots and livelihood. In choosing the latter option, they faced armed ranchers and farmers who would defend private property at any cost. And so began the worst human rights violations and violence against the Kaiowá and Guarani peoples to ever occur. Though the Brazilian Federal Constitution guaranteed indigenous people the right to the land in 1988, it also established a limit of ten years to demarcate and hand over the land, and compensate farmers. Now, after 30 years, the demarcation process is far from completed. Since the early 2000s, land reoccupation conflicts have intensified. According to one survey, some 258 Kaiowá and Guarani leaders were murdered in Mato Grosso do Sul between 2003 and 2011. These ongoing violent conflicts, the displacement and the ongoing genocide of the Kaiowá and Guarani have been internationally denounced. Yet, even though it has received global attention, it is still seen as only a local problem. One of the main reasons why the land conflicts haven’t been resolved is down to the value of agribusiness. Farming is championed as the flagship of the Brazilian economy, with increasing portions of lands being used to intensify industrial and mechanised agriculture. In the last ten years, this sector has grown further, along with the exportation of commodities, especially soy. Brazil has been declared a global agribusiness powerhouse, and praised for supplying the “four Fs” – food, feed, fuel and fibre – to the world. While we were in Brazil, we saw the everyday threats of living in a contested territory surrounded by industrial plantations. We witnessed three occupied villages near Dourados being evicted, to make way for large scale monocultures (where one crop is grown). Though the Kaiowá and Guarani were there protecting their lands with indigenous rituals, they still expected the worst to happen – and so did we. We prepared an escape plan with the people, whereby we researchers would save the children if military troops arrived. Although the eviction was ultimately postponed, this shows how the Kaiowá and Guarani live in constant fear of being removed from their land, of being intoxicated by the contaminated water, air and soil, of been killed. During our research, we also visited families who had been evicted from reoccupied areas due to agribusiness expansion, and left with no land. Squeezed between sugar cane, soy and corn plantations, they were ousted to the sides of roads. We spoke to an indigenous leader, who was living at the edge of a road, driven from her indigenous land. She cried over the death of her husband and son, which were due to land conflicts, and lamented the health problems that came from chemicals put by agribusiness on the land. She mentioned that the children specifically had increasingly experienced headaches, stomach problems and sickness, which they believed was due to water contamination – and that some of them had lost their lives. She told us of the challenges to her people’s livelihood and the unbearable situation to which they are now condemned. One of the indigenous leaders claimed “Europeans should know that in the bio-ethanol they are importing from Brazil they will find our blood”. While, sugar cane, soy and cattle take over the landscape in the southwest of Mato Grosso do Sul, it is impossible to ensure a healthy livelihood for the Kaiowá and Guarani. They have no access to drinkable water, no protection from agro-chemical contamination, and no adequate conditions for planting, hunting or fishing. The conditions are violent and the Kaiowá and Guarani people are in a precarious position. In the name of global development, progress and sustainability, the silent genocide of one of the largest ethnic groups in the country is taking place. “Earth, life, justice and demarcation!”– the cry of the Kaiowá and Guarani people.